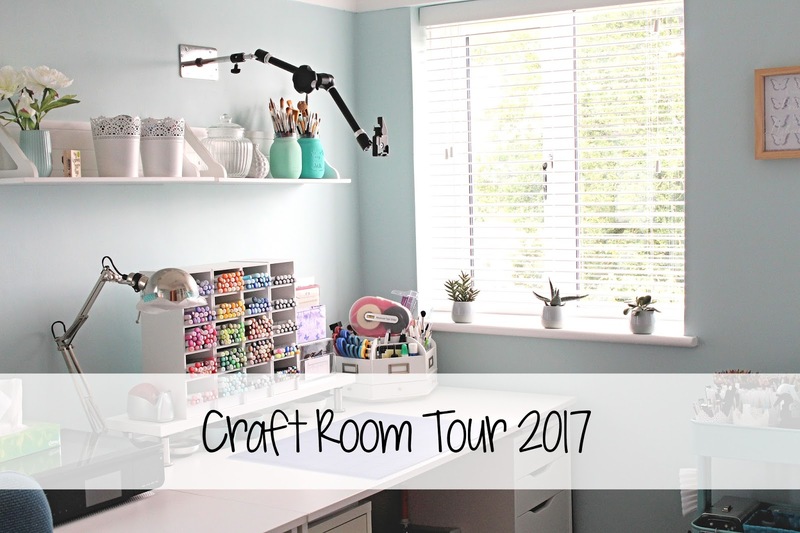 Hello there, today I have my craft room tour of 2017 to share with you. Since I redecorated a month or so ago, I have had requests to make a new tour. Well of course, that's what I did! Before we get started, like I mention in the video, I make these tours because people like to watch them. I am no way doing it to share what products I have or anything like that. That is just not who I am. 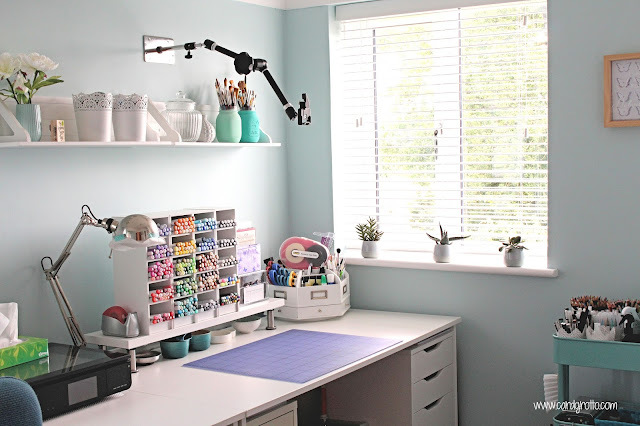 I enjoy watching craft room tours myself so that I can gets tips on how people are storing and organising their products. I am always on the look out for how people organise things. I have a fairly small room (it looks bigger on camera than it is in real life!) but I am incredibly grateful to have it. I like to keep it neat and tidy and as you will see in the video, I have a place for everything. I also find it important to have some space to grow too. This kind of organisation will not be right for everyone so please find what works for you. Some people like to have things out so that they remember to use it, some people like to have everything behind cabinets. Do what works for you! I myself like to have a combination of both. So let's get straight into the videos. I had so much footage that I split it up into two parts. I hope that is ok with you. Although two 30 minute videos are long, I didn't think anyone would want to watch an hour video either! I have two large desks taking up the length of one side of the room. I use one for more office/computer needs and the other for crafting purposes, although when crafting I do often use the space in front of my computer for my guillotine or for just extra room. Under the desks are Helmer units from Ikea. I love these little units. they are metal and look a lot like mini filing cabinets. I like them because they are narrow but deep so I can fit a lot in them. Above my desk, attached to the wall is my filming set up. I use a Manfrotto Magic Arm to film from above. Links to the set up and products are over on my FAQ page. I also recently bought an Alex unit. I wanted some taller (height wise) drawers so that I can fit taller items in them. mainly envelopes (standing up), spray bottles and then my new storage of my Distress Ink Blending tools. 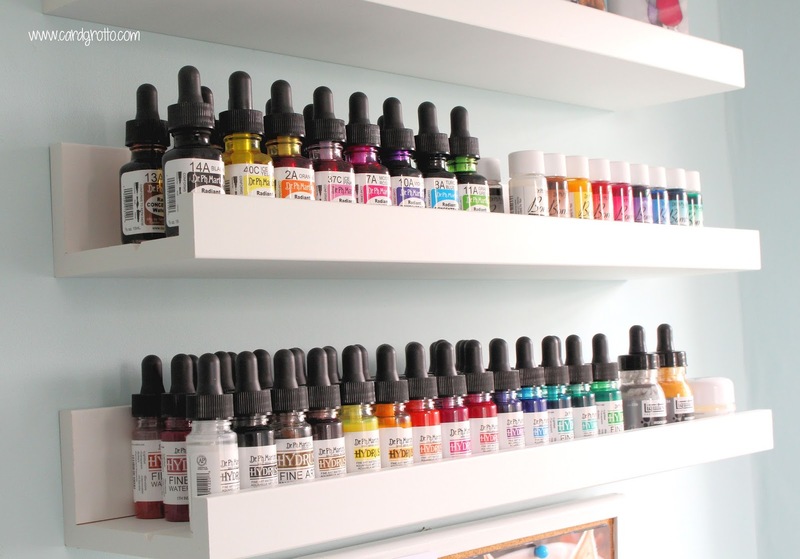 I believe Ardyth came up with the solution of storing ink blending tools in nail polish holders. I searched everywhere to get some but none of them fitted (the gap was too small). My friend Stephanie kindly sent me two over from Canada and I am absolutely love them! I have my most used colours in there, plus some extras (blank ones) for the colours that I do not use as much. I haven't filled up completely yet, I still need to buy more tools but I absolutely love it. The tops of the tools have labels on them from the Ranger website (I just printed them on to removable label paper and punched them out with a 0.5" circle punch). 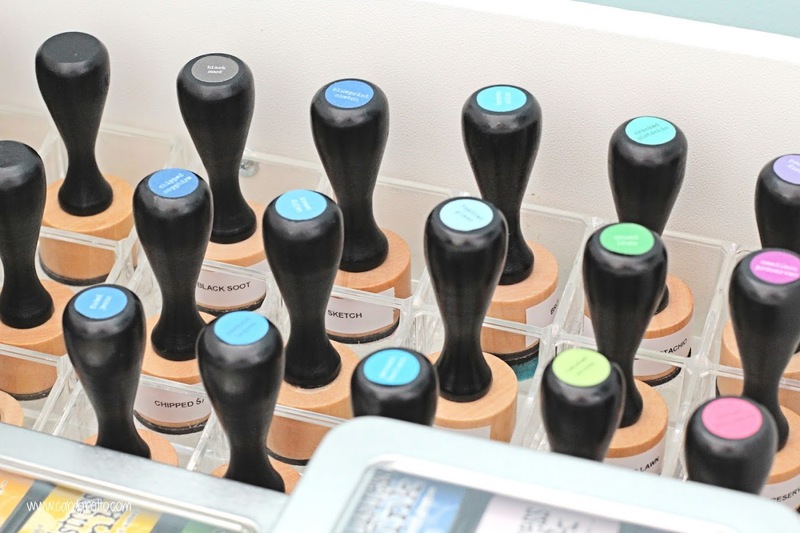 I also printed larger labels to go into the nail polish holder itself (I punched them out with a 3/4" inch circle punch) so that I know where the tools go. A big thank you goes to Stephanie and Ardyth for this fabulous solution! My Raskog is next. Boy, do I love this thing! It holds a lot of stuff! In my case, I have lost of Ikea Skurar pots on the top. These hold pencils and pens. I like them in the pots as they are easy to grab. I also have my swatch folders on the top shelf. You can see a post about those here. Next up is more pen storage, along with my Alcohol Inks. Finally, my Cuttlebug lives on the bottom shelf, along with it's cutting pads and some other tools. Another new addition to my room this year is this Hemnes unit. I got the one with the doors on and I love it! It holds a lot of stuff! In it I have all of my stamps, cardstock, paper pads, dies and extra tools. I storage my stamps in Avery Elle stamp pockets. I use both the large size (for 4" x 6" stamp sets) and the extra large size for all larger sets. I add a piece of inexpensive cardstock inside, followed by the stamp set. If I have a coordinating stamp set, I add this in the back on magnetic sheet. The stamps themselves are store in either Muji Acrlic DVD boxes (sadly now discontinued) or Kvarnvik boxes from Ikea. I have made dividers for them by cutting up swing clip folders. I rounded the top corners and simply labelled them using my Label Maker. For stand alone dies, I keep them in EZ Mount Binders. Although the post is old now, I will link to the one I did a few years back which you can see here. I still store them in this way. I store my stencils in a binder too. Again, I have a post and video about this here. I have all of my 8.5" x 11" cardstock in magazine files. I then have the cardstock in 9" x 12" zip/grip lock pockets. I just cut the top off the pocket and popped the cardstock inside. I got the pockets that were the thickest. They are not really sturdy but they do the job. I also have dividers in between the cardstock so I know what colour is what, you can see how I made them in a video here. 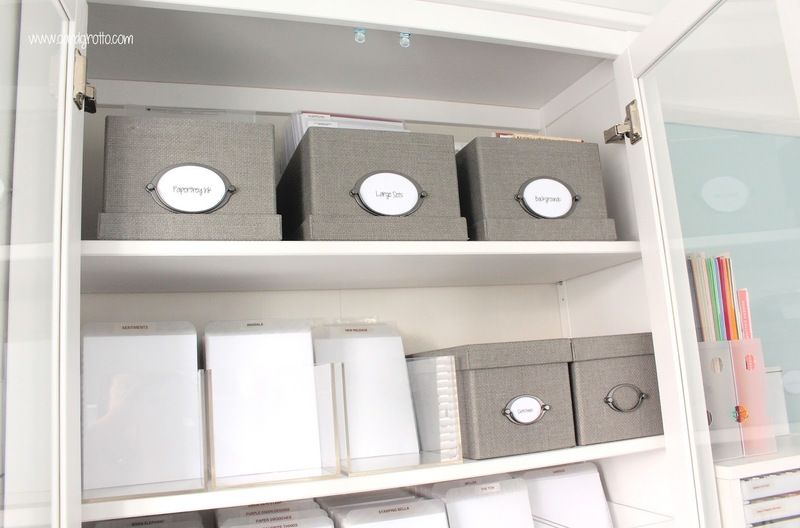 My 6" x 6" paper pads are stacked up and store in Interdesign containers. I also have some 12" x 12" paper that are in Cropper Hopper Magazine Files. Nest up is my ink pad storage. 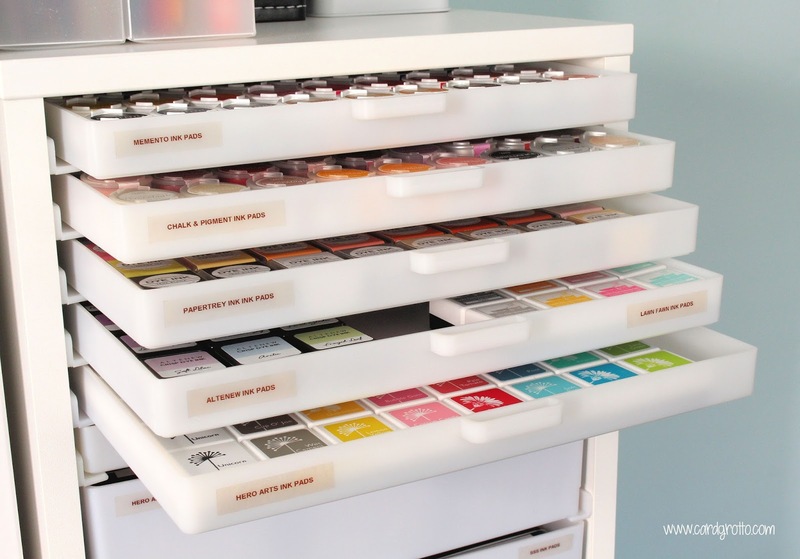 I have them stored in drawers in my Stackables/The Best Organizer cabinet. The first few drawers are for smaller ink cubes and then I have the larger ink pads up on their sides. This way I can fit more in a drawer and I can easily grab the one I need. I have had no problem standing my ink pads up on their sides. 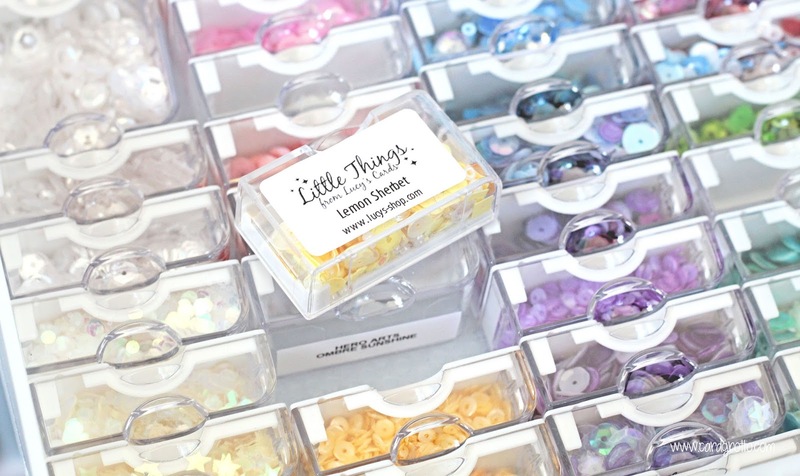 My embellishments are also in a Stackables/The Best Organizer unit. I keep smaller embellishments in here, along with stickers, ribbon, twine and glitter. I have a post and video about my sequin storage here. Here are the links to what I have shared in the post and video. Affiliate links are used on some products. This means that if you make a purchase after clicking on my link, I receive a small commission with no extra cost to you. I truly appreciate your support when using these links. Please click on the shop logo below the product to shop at your favourite store. Wow! Wasn't that along post! I hope you enjoyed looking around my room. If you have any further questions, please leave them below and I will try my best to answer them. thank you so much for visiting me today. I hope you have a great day! 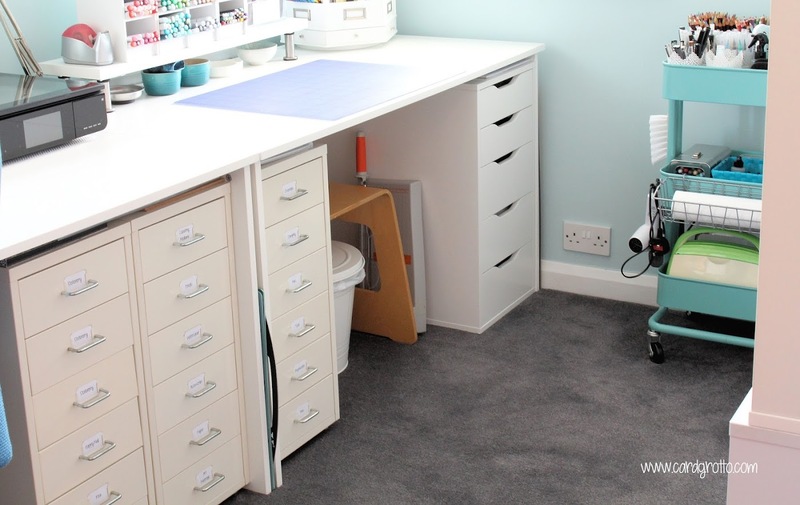 Hi Michelle, thank you so much for sharing your revamped craft room. I too was gutted when I discovered that MUJI had discontinued the DVD boxes. They were ideal for 6x4 stamp sets and fitted my Billy bookcase shelves perfectly. I would love a dedicated craft room. I have stuff all over the place. Perhaps one day. Once again thank you for the storage ideas. 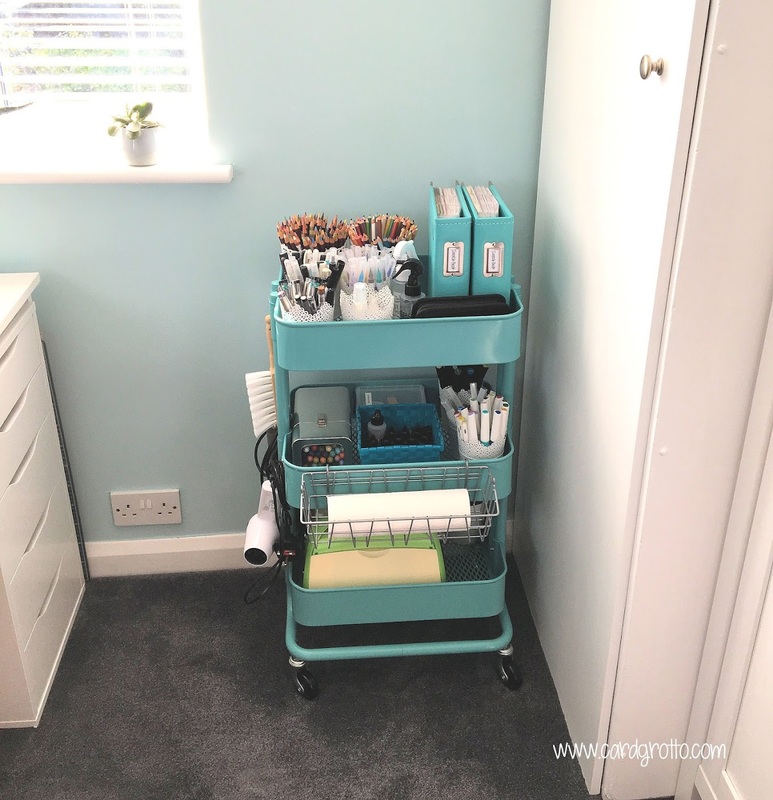 I love your organisation ideas, I just wish my craft area was as pretty & neat! But I really wish people didn't make you feel as though you need to apologise for having lots of stuff. Spend your hard-earned money however you wish! Thank you so much Michelle for doing this and for answering my questions the other day. 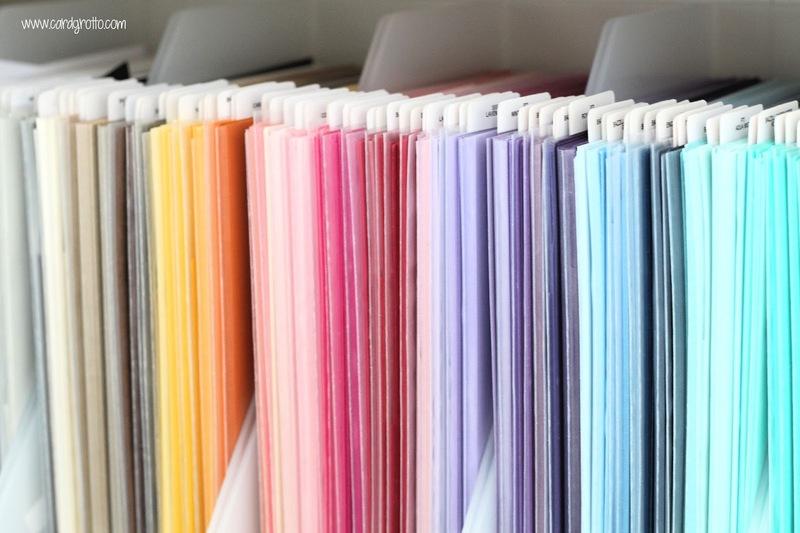 I love how organised you are and I always find great tips on storing and organising from you. I can only dream and drool, being ever so happy for you and your incredible craft room! Thank you for taking the time to show us what it can be like!!!!! I always love your tours, always something new to see. Just a heads up though, if you want to purchase any more of the ink blender storage or let those in the UK know where to buy. I too struggled to find any, but I just recently purchased some on Amazon UK for what I thought was a very good price. https://www.amazon.co.uk/gp/product/B00N4YZA9K/ref=oh_aui_detailpage_o02_s00?ie=UTF8&psc=1. Hope that helps someone! Love how everything is so organized. Lovely. I checked the Ranger website and could not find the labels for the distress blending tools. Is there any way you could maybe post where on the website it may be. I tried entering "labels for distress blending tools" and it came up with 3 different things and I looked at each but did not find them. I would love to find this template. Thanks for sharing videos of your room it is gorgeous. 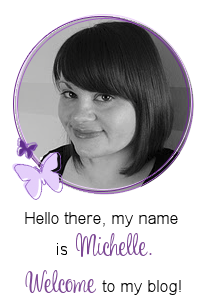 Your craft studio is beautiful, Michelle! Thanks for the tour and all of the tips!!! 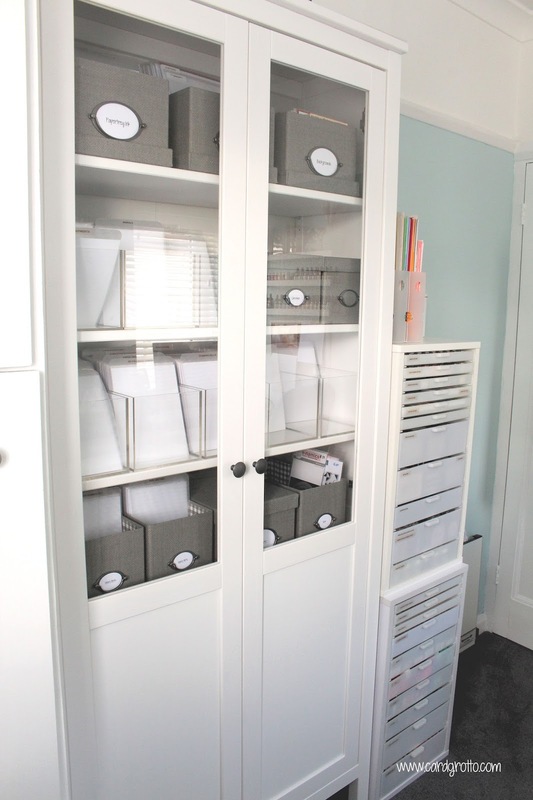 I love how organized and neat and tidy your space is! You've inspired me to get on the ball and get my studio whipped into shape! OMG! That looks amazing, Michelle. Storage Heaven. Puts my wonky, old dining table and odd boxes to shame. Thanks for sharing your space, and storage solutions. I definitely need those nail polish holders - they look fab. 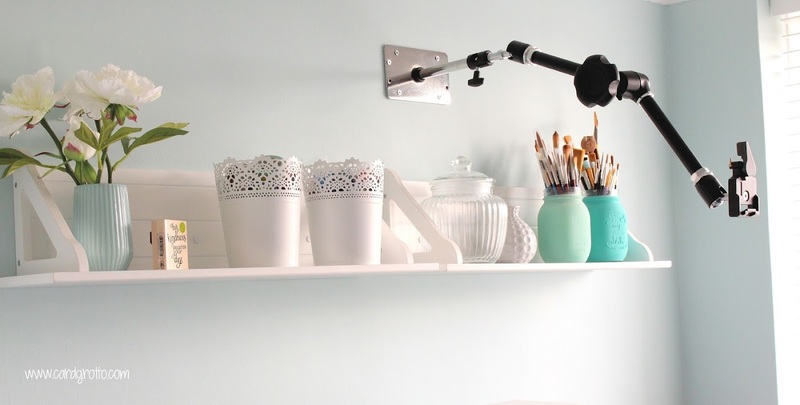 Love, Love, Love your craft room and all your fantastic organization ideas! I appreciate the tour as I know how time consuming it can be. 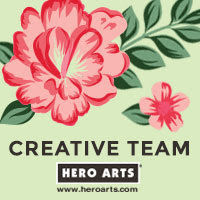 Thank you for sharing your crafty world with us!